Cambridge Brass and the Hamilton Big Band will bring you a concert of music in recognition of the all those who have put themselves at risk in the service of New Zealand during times of conflict or as peace keepers. The band will play in support of the Dawn ANZAC Service. Cambridge Brass will play at the ANZAC Civic Service. The Cambridge Brass Quintet and elements of the Cambridge Brass Auxiliary Band Cambridge Brass are performing an ANZAC Day concert in the Waikato Museum. 2019 marks the 80th anniversary of beginning of the Second World War in Europe. Caroling About the District in 2018. The Band in the December 2018 Mouthpiece. Le Quesnoy Liberation Centennial Trip. John Hargreaves is in the August 2018 Mouthpiece. Cambridge Brass Junior Development Band Chosen as Warehouse Neighbourhood Partner. Cambridge Band on the Cover of the June 2018 Mouthpiece. Member Recognised for Seventy Years Service. St Patrick's Day in Putaruru. Cambridge Quintet at the Hamilton Gardens Arts Festival. St Andrews Church Craft Fair. Cambridge Autumn Festival: Main Street Carnival. Cambridge-Le Quesnoy Friendship Association gathering. On the second of March the Quintet played at the Mansfield Garden Party. 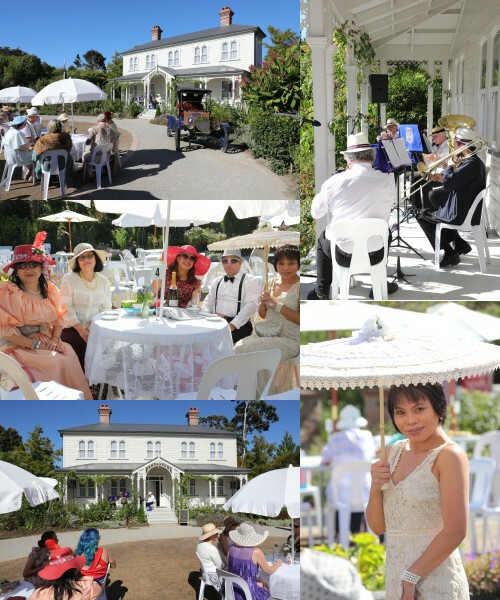 The Mansfield Garden Party is a regular event in the annual Hamilton Gardens Arts Festival. This year the event was held in the Katherine Mansfield Garden, a garden only opened late last year. At noon the band then played and participated in the Cambridge-Le Quesnoy Friendship Association's gathering. 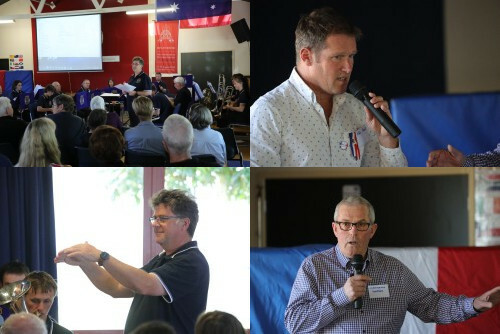 The band was one of the groups who gave a presentation on their participation in the centennial commemorations of the liberation of Le Quesnoy by the New Zealand Division in France last year. The following day the Quintet gave a concert for the closing of the Katherine Mansfield Exihibition in the Waikato Museum. 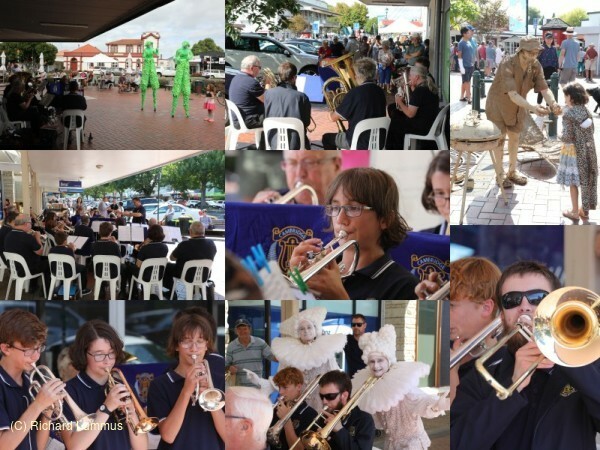 Later in the month the band played at the monthly Trash and Treasure and on the 24th both the Quintet and the Senior Band played in the Cambridge Autumn Festival Main Street Carnival. The Quintet playing in a pavilion beside Turtle Lake in the Hamilton Gardens. Members of the Cambridge Jazz Band. The Auxiliary Band at the Family Fun day of the Hamilton Gardens Arts Festival. The Quintet, the Senior and the Auxiliary bands were all back into their normal rehearsal schedules in February. Late in the month a new entrant appeared on the scene, the Cambridge Jazz Band. Our first performing event was at the Lions Cambridge Trash and Treasure on Sunday the tenth followed that afternoon by the Quintet playing in the Hamilton Gardens by Turtle Lake. On the morning of the 16th the band played at the openning of a Lions Club convention in the Don Rolands Centre at Karapiro. 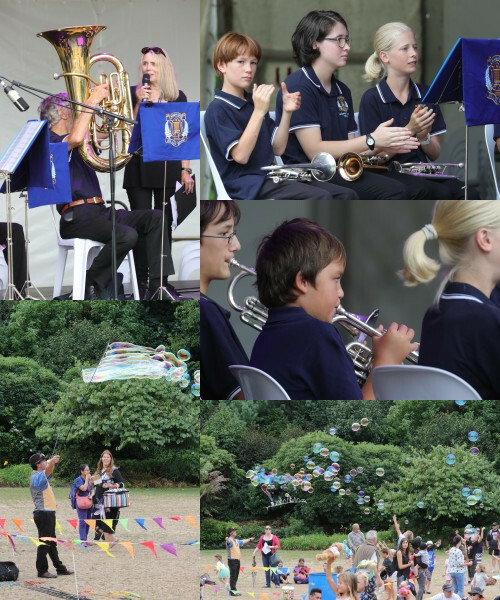 This year the Auxiliary Band played in the Family Fun Day of the Hamilton Gardens Arts Festival. For those not familiar with the Hamilton Gardens Arts Festival, it is an arts festival that attracts international and national artists held for about ten days in the renown Hamilton Gardens. Caroling at the Moxon Centre. Cambridge Brass at St Stephens. Cambridge Trash and Treasure December 2018. The Quintet playing in the Waikato Museum on the Sunday before Christmas. In November 2018 the band visited the old fortified town of Le Quesnoy in northern France to be part of the centennial commemorations of its liberation from over four years of german occupation in the First World War. On the fourth of November 1918 during the Second Battle of Sambre the New Zealand Rifle Brigade, part of the New Zealand Division, liberated the small French town without any civilian loss of life and little damage to the town. Inorder to minimise damage and civilian casualties there had been no artillery bombardment and the brigade resorted to ladders to overcome the medieval ramparts of the old town. The town has never forgotten the troops who came from the "uttermost ends of the earth" and their sacrifice. The town commemorates ANZAC Day, has named streets after some of the soldiers, has a street named after New Zealand, and gardens with a New Zealand theme. 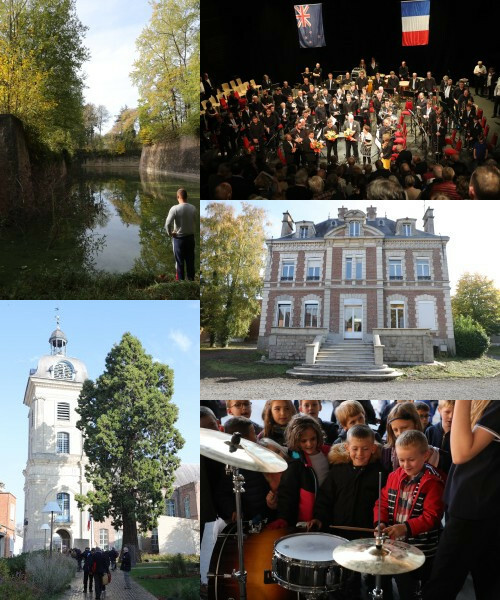 The Quintet, the Auxiliary Band and the Senior Band all performed while in Le Quesnoy. The band participated in the opening of the New Zealand War Memorial Museum in Le Quesnoy, played in resthomes and at a primary school. Our time concluded with a joint concert with the Brass Band du Hainaut and Harmonie Municipale du Quesnoy. A page of photographs taken during the band's stay in Le Quesnoy can be found here. The Cambridge Oompah Band, formed esspecially for the event, played at the Putaruru Memorial Services Club. The Cambridge Brass Junior Developement Band has been chosen by the Cambridge Warehouse to be part of their customer choice programme. When you shop in the Cambridge branch of The Warehouse between 1 August and January 2019 you can collect a token and vote for the Junior Development (Auxiliary) Band. Your support will help the Junior Band to grow with more young members from our community. The money raised will be spent on learner instruments, music and tuition. Thanks to The Warehouse for choosing us as their Neighbourhood Partner in Cambridge. Cambridge Brass and St Peters combined to perform a concert at St Peters School Cambridge to raise funds for the band's trip in November 2018. Thanks to St Peters for sharing their facilities and talent with us. Rob Hocking our Principal Cornet and Assistant Musical Director is on the cover of the June 2018 BBANZ Magazine playing the last post at the 2018 Dawn ANZAC Parade. Also on the front page is a photograph of the Auxiliary Band taking a bow at the ANZAC Tribute Concert. Further back on page eight is a short article on the connection the Band has to ANZAC Day and Le Quesnoy. At the 2018 Annual General Meeting seventy years of playing for the band by John Hargreaves was celebrated. The band presented John with a framed copy of a photograph of the band taken in 1949 with him sat between the Band Conductor and the Mayor. John Hardgreaves receiving a framed photograph of the band in 1949. Rob, John and Jean with the cake. 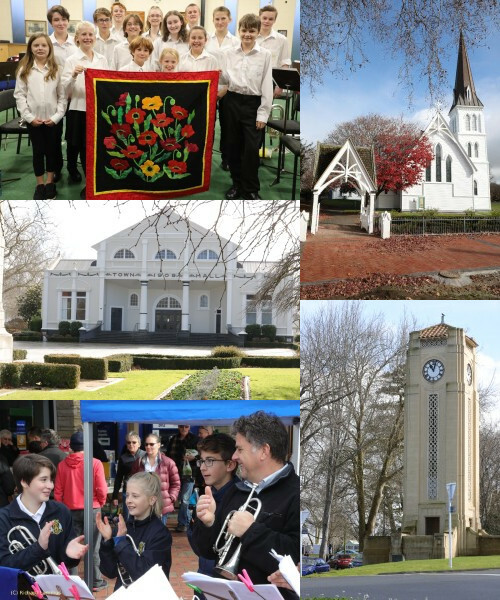 The Cambridge Oompah Band played at the Putaruru Memorial Services Club. The Quintet had a long day on the final day of the annual Hamilton Gardens Arts Festival. It started with being the first group to play in the Rogers Rose Garden at the Mansfield Garden Picnic. The Mansfield Garden Picnic is an event to raise funds for the expansion of the themed gardens. People are encouraged to dress in the style of the inter war years and picnic while listenning to good music from the period. At 1pm the "Rusty Player Orchestra" took to the main stage on the Rhododendron Lawn. This is a scratch orchestra for people returning to playing and anyone wanting to play in a stress free environment. Waikato brass band players are well represented and the range of instruments played a challenge for the music librarian. The first half is a rehearsal session for the rest of the session where the music is played as a mini concert. While the Trust Waikato Orchestra did their sound check and final programme run-through the members of the Quintet not in the Sunset Symphony raced off to Cambridge to play in the St John adults awards. They returned to play for half an hour to the gathering crowd for the Sunset Symphony. The night ended with the Sunset Symphony and fireworks. The Quintet playing in the Rogers Rose Garden at the Mansfield Garden Picnic. In the early afternoon a number of brass band musicians played in the Rusty Player Orchestral on the main stage. Brass musicians from Waikato brass bands were well represented. Having played at the Cambridge St John adult awards the Quintet returned to play to the gathering crowd. Hamilton Gardens Arts Festival 2018 Sunset Symphony from behind the trombones. 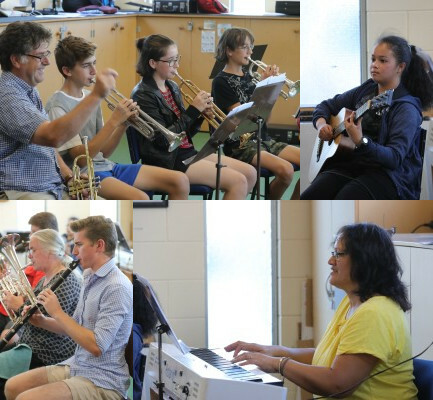 The musicians come from all over the Waikato, the Bay of Plenty and Auckland with the youngest being thirteen and the eldest in their eighties. It all ended with spectacular fireworks. Many thanks to the Ede family and Chris for manning the drinks and produce stand at the craft fair this morning. The real workers for the band.